FIVE twisted walking-sticks, carved from apple and casuarina wood, acrylic painted, the incised patterns on their shafts burned in. A filigree of gold and silver leaves and flowers, sketched in minute detail with pencils and felt pens. An embroidered figure, ambiguous, half-girl, half-bird. A little wooden model of a light aircraft, one of its wings painted in bright colours, one skeletal, exposed, showing the bare ribs and struts of its frame. What single category might enfold these disparate objects? How could they have anything in common, besides their distance from a mainstream understanding of what art should be? Renegades, an ambitious survey of outsider works showing at KickArts in Cairns, displays them all. It is that rare thing: an exhibition that attempts at once to present and to redefine its field.The genre is more than a century old. The term outsider art was devised in the mid-20th century to describe the wide array of paintings, drawings, sculptures and found or embellished objects made by the mentally ill. The first collections of such works were amassed even earlier by clinicians in Germanic central Europe, where analogies had long been drawn between the derangements of madness and the transports of romantic inspiration. What was the artist if not a heroic figure, braving the dark recesses of the mind?The argument drew strength from the examples of troubled masters of past times such as Francesco Borromini, Hugo van der Goes and Vincent van Gogh. When French painter Jean Dubuffet established his museum of art brut in Lausanne in 1976, outsider art at last had its great temple and its canonic figures: asylum patients, loners, eccentrics and obsessives, all of them possessing their own style and grace.The time was right. The appetite for such works spread across Europe and the Americas; the definition began to blur. Outsider art had soon expanded to include the wilder shores of naive art, folk art and the work of self-taught artists. Outsiders could even be painters and sculptors from geographically remote areas or isolated traditions. Just as definitions of insanity and madness have been revised and theories of mental function and treatment of disorders have been in flux, so too has the study of outsiders been evolving in recent years. The Australian pattern was typical: the first collections were of artworks made in psychiatric hospitals. By the 1980s, groups of artists of various outsider stripes had coalesced and were exhibiting, and achieving prominence. The first public gallery shows followed: at the Orange Regional Gallery in 2005 and the Monash University Museum of Art in 2008. What, then, is so strikingly new about the exhibition at KickArts, a contemporary space in the heart of touristic Cairns? The answer is bound up with the intriguingly cosmopolitan world views and trajectories of the gallery’s director, Ingrid Hoffmann, and the show’s specialist curator, Camille Masson-Talansier. For this is the first exhibition of outsider art to bring together mainstream and indigenous Australian artists: a decision that bears Masson-Talansier’s stamp. In recent years she has worked in art projects as far afield as France and New Mexico, Redfern and the Lockhart River community on the east coast of Cape York. Hence the wide curatorial net she casts; hence her constant presence on the creative frontline. While planning the show, she accompanied artist John Demos when he went shopping for paints from his home at Macquarie Hospital’s mental health facility in North Ryde, Sydney; she spent long hours at Arts Project Australia in Melbourne, which gives artists with an intellectual disability a studio setting. 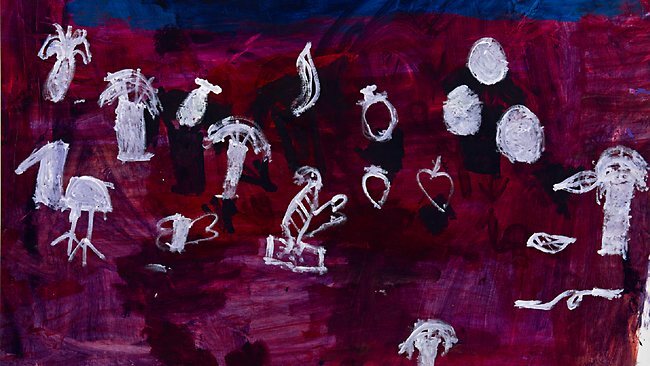 She has chosen paintings from two indigenous disability art centres: Ngaruwanajirri on Bathurst Island and Bindi Inc in Alice Springs, as well as work defined by its geographic outlier status from Darnley Island in the eastern Torres Strait. Inclusion is her watchword, and it implies a standpoint: « celebrating the artist and not the disability, upholding the creative stature of an individual with a particular vision to share ». Many strategies for redefinition of the outsider field have been adopted and found wanting in past decades. As Hoffmann concedes in her introduction to the exhibition catalogue, « disputes over terminology cause heartburn ». The artworks on view in the galleries are the exhibition’s best manifesto: like much outsider art, they possess a poignant delicacy and charm, and their appeal is deepened by acquaintance with the stories behind them. The embroidered bird-girl is a piece by Joasia Redestowicz, a Sydney textile artist of great distinction who seeks to represent in her works the « many years of suppression that my thoughts have endured ». French jazz musician Marc Bour’s vivid Puppet Master drawing of large-eyed faces testifies to his repeated « emotional traumas » and his hard-won pathways to self-discovery. The five walking sticks are from a linked set of 100, telling symbols, made by Grafton artist Peter Drewett in a self-help scheme. As for the little aircraft with one painted and one uncovered wing, it bears the title Left and Right Freedoms, it is the work of Bernard Vartuli and it tells a tale. Vartuli loved building model aircraft as a child and he also had a fondness for copying the work of great masters: El Greco’s dark-shaded View of Toledo was a special favourite and it lingered in his thoughts. In due course, Vartuli became an aircraft mechanic, working mainly on light planes and crop-dusters, but in mid-life, soon after embarking on a project of formal art studies, he fell victim to a paralysing auto-immune disease, and was hospitalised for many months. It is such stories that form the seed capital of Renegades and that do much to explain the sharp pull to the heartstrings exerted by individual pieces as well as the impact of the exhibition as a whole. How direct the artists’ communications, and how unmediated by the standard cultural baggage-train of contemporary work! The boundaries are set very wide: there are ceramic warrior figures made by a group in remote Darnley; there is a colourful « wheelbarrow of children » pencil drawing, one of a vivid pair by Anthony Romagnano of Arts Project Australia; there is John Murray’s landscape in deep purple and midnight blue with white figures interspersed – a work from Girringun Aboriginal Art Centre in Cardwell, Queensland, supported by a rough-hewn, unglazed pot from the same creator’s hand. But without sharp, field-defining limits, what can an exhibition seek to convey? Simply, what it shows. Work that lies across the borderline of the established art scene, work that shines by its own light, rather than the reflected gleam of accepted tastes and fashionable fame. Of course there is a catch in this strategy: outsider art, whatever label is affixed to it, is always susceptible of being taken up, received, appreciated, assimilated into the contemporary pantheon – of being drawn into an « inside » space. So it has been with many of the art brut pioneers in Dubuffet’s museum and others of the kind; so it is with a few of the artists shown in Renegades. Collectors and galleries seek the new, and some will find it here. But artists make work principally to be seen, to escape the self, to share what hides inside them: and a view to the frontier brings its own horizon glow. This is the declared aim of the exhibition’s conceivers: to reveal that well-masked light. KickArts director Hoffmann speaks of illuminating « the very essence of creating art in unlikely environments », of calling on « illiterate people, people with an experience of mental illness, hermits and those marginalised by disabilities », even those « not aware they were making art ». And so the focus shifts – from the condition of the maker to the beauty of the things made; from the category to the artistic gleam. By this decision, the controversies of definition are bypassed, if not resolved: Renegades succeeds at once in paying its careful respects to the otherness of the artists it presents and maintaining an emphasis on the strangeness in their art. Here is Masson-Talansier on this most delicate of intellectual procedures: « The consensus internationally at present is that to rub out the notion of otherness in our artistic context would not reduce stigma. » When working as director and artist in residence at the Weave Art Centre in Sydney’s Redfern two years ago, she repeatedly discussed these questions in detail with her colleagues and others in the studio. The view was that evacuating the notion of mental health would not be helpful to artists with mental health issues, and she believes this is the stance of most artists she has worked alongside, in hospitals and elsewhere. From this, perhaps, stems the key curatorial strategy of Renegades – show outsider work, but show it with other « outside » work from the edges of human experience, from remote locations, from the unseen corners of our world. Show what is distant; include it and bring it near. Renegades: Outsider Art is at KickArts Contemporary Arts in Cairns until July 27. Next year it will tour to the Gold Coast City Art Gallery, Grafton Regional Gallery and the Hawkesbury Regional Gallery.